To be considered an All-Academic Team, programs must have compiled a cumulative GPA or 3.10 or greater and competed in at least five different meets with at least five runners representing their school at each. Coach Mark Northuis’ Flying Dutch recorded a team GPA of 3.50, while his Flying Dutchmen had a 3.30 GPA. The Flying Dutch have been named a Scholar Team Of the Year every season since the program started in 1990. The Flying Dutchmen have made the grade all but one time during that stretch. Both teams saw several of their runners lauded individually as well. Scholar honorees must have a cumulative GPA of at least 3.30 and have finished in the top 25 percent of finishers at regionals. The Flying Dutch had five recognized: juniors Michelle Kerr of Dearborn, Michigan (Divine Child HS), and Julia Stock of Spring Lake, Michigan (Grand Haven HS), sophomores Erin Herrmann of Wheaton, Illinois (Wheaton-Warrenville South HS), and Emily Joosse of Chillicothe, Ohio (Zane Trace HS), and freshman Rachael Webb of Grandville, Michigan (Grandville HS). The Flying Dutchmen had three: sophomore Tyler Brinks of Commerce Township, Michigan (Walled Lake Northern HS), senior Zach Zandbergen of Grandville, Michigan (Grandville HS), and senior Ben Zank of Midland, Michigan (H.H. Dow HS). Northuis said being named again to the national All-Academic Team list, as well as several individuals being honored, speaks very well of the quality of student-athletes in the Hope program. “We are very proud of their accomplishments in the classroom and on the cross country course as they represent Hope College,” Northuis said. Overall, 211 women’s teams and 152 men’s teams earned All-Academic honors. Beyond two Scholar Athletes of the Year, 325 women and 246 men in Division III earned USTFCCCA All-Academic honors. The Flying Dutch came in 23rd at nationals and fourth at regionals. Stock led Hope at nationals with a 107th-place effort. 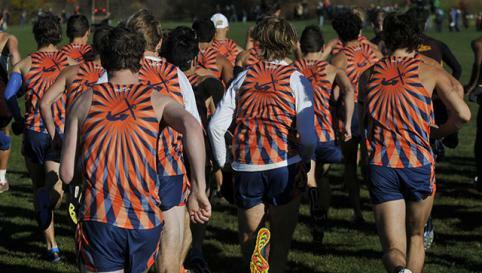 The Flying Dutchmen took sixth place out of 37 teams at their Great Lakes Regional. Zank went to nationals and finished 120th out of 280 runners.